The World of Warcraft community has always found things they latch onto, from particular sites, to blogs, podcasts, and even E-RP hangouts (I have not set foot in Goldshire for 2 years and I turn off general chat, just in case, anytime I step foot in Elwynn Forest – I suggest you do the same). Recently I stumbled upon Allakhazam again, and I have to say I really like the new design and feel. It focuses very much on article posting, it even has a direct database tie in with WoWHead (there may be some connection there in terms of ownership perhaps, I was lazy and did not dig further, my apologies). The forums, which were always a big part of Allakhazam, the community aspect of the site, look to be very active. And it looks to be posting some good content. I know it is difficult at times for Wrath babies to comprehend a time prior to WoWHead, but alas, there did exist other resource sites, and this is one that very much deserves a first, or second look for those of us that have been playing the game since launch. 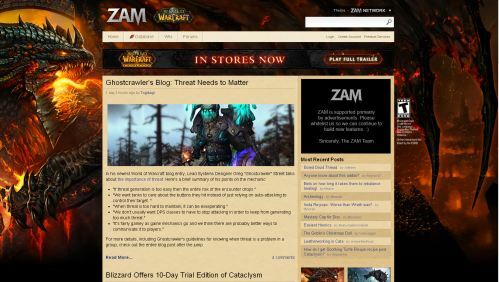 The site also features portals for other, in-network sites for different MMO’s, such as Guild Wars 2. The layout and design are very simple, it has a good clean look to it, and as I said, the content is good and I like the article writing. So give it a try, expand your information database collection. PS. The OverLores are coming! Allakhazam was a must have when Everquest was in its heyday. EQ didnt have patch notes and it was used a lot for item updates and spell changes like how MMOChampion is to WoW. Two things though. First, Blizzard actually did a really good job of culling the ERP, and Goldshire has been more or less deserted from what I’ve seen. Second, it’s now Wowpedia, not WoWWiki. I visited the old site a few days ago and looked at the recent changes feed, and it’s amazing how many people still didn’t seem to know it had moved. Wikia really is the “AOL of wiki hosts” as someone else put it recently. I remember Allakhazam and Thottbot. As a returning blogger, it was not immediately obvious to me that WoWWiki had moved. Only when I saw the post here on TNB did I find out about the Wikia issues. I think one of the problems is that WoWWiki links still appear on top of Google searches for WoW subjects. Only when Wowpedia gains enough following that this changes will the Wikia site be abandoned. I suppose I am a creature of habit, as I just wrote that post mentioned, on WoWWiki’s move to Wowpedia. I have just been typing the former name so much that it was pure muscle memory and thought oversight =) And I agree, I look forward to when Wowpedia has enough hits on the search engine algorithm to overtake it’s former name. I went to have a look at the new ZAM site but was sadly disappointed when it launched a popup. Now I don’t care how good the site is. Fail. My apologies Razorbax, I hope I linked the site properly, though I must say I believe you had an isolated incident. I’ve visited the site many times on multiple browsers and have not had a single pop-up. Often pop-ups will spawn when you have, already, an infected file or malware on your machine. I’d suggest running something like Malwarebytes and also CCleaner to clear out your cache, cookies, and browser history.